Allied forces, including the Royal Canadian Navy, fought against Axis forces in the battle of the Atlantic over a vast and often dangerous oceanic battlefield. Harbours and bases like Halifax were essential for ships, and commanders on shore planned and coordinated the movements of convoys and anti-submarine forces. 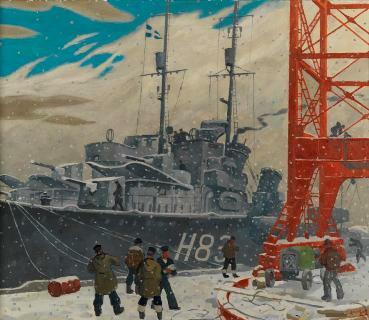 Major ports like Halifax offered facilities for the docking, resupply, and repair of ships like the two Canadian destroyers depicted in Edwin Holgate's 1941 painting. The destroyer closest to the dock is HMCS St. Laurent, and the metal framework at right is likely part of the prominent crane at Jetty Three in the Halifax Dockyards, which featured in a number of artists' works. Holgate painted this work before the establishment of Canada's official war art program in 1943. He later went on to become an official war artist with the Royal Canadian Air Force.